Touring a new city on foot always brings the place to life, and a good food tour adds an element I especially enjoy. Tom and I began our exploration of Portugal’s northern food scene by walking the hilly terrain of splendid Porto. It was a gloriously sunny day in May, with a light breeze, just right for tramping across broad avenues and plazas, before diving into steeply pitched cobblestone streets. 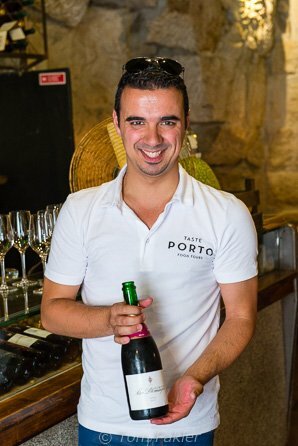 Our host, André of Taste Porto Food Tours, loves his city and loves to show it to visitors in small group tours to his favorite places. There is much to see–and taste–here, and our half-day walkabout proved the perfect introduction to the city. In operation for just over a year, Taste Porto is firmly focused on food tours. André also introduces visitors to his favorite local restaurants and wine tastings for further individual exploration. A Taste Porto tour supports good works, too. A percentage of the price of each tour ticket sold is donated to AMI, a local organization helping the homeless. 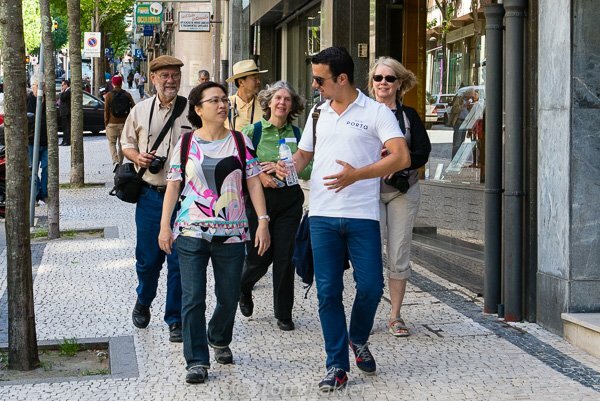 André’s lively tour emphasizes local traditions, enriched with innovations from across Portugal. We met long-time shopkeepers, and young entrepreneurs bringing authentic regional flavors to Porto from Trás-os-Montes and as far afield as Alentejo. Our tour was a “city walks intensive”, with plenty of opportunity to work off the calories we packed away. Porto, like Lisbon, is quite hilly, a fact of geography that put more than 13,000 steps on my Pedometer in the name of Portuguese food and wine. We began our walk at the Bolhão Market, and ended with sweets at Praça de Guilherme Gomes Fernandes in Porto’s ancient Vitória neighborhood. We began our tour at Porto’s Bolhão Market. The market is in disrepair, its offerings in transition at the moment, suspended between what was, and whatever is to come, as the city re-purposes the space. It is unsettling to meet vendors about to lose their livelihood, but good to visit, and to support them, while some traditions remain. 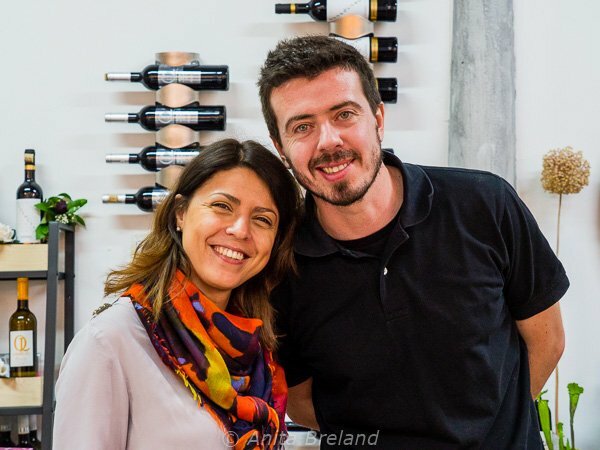 Hugo and Patrícia of “Bolhão Wine House” have brought new life to the market space previously used as a flower shop. Well-designed, modern and inviting, the shop offers a range of regional food and wines. Our host at Taberna do Largo grilled sausages, heated cheese, and poured just the right wines for each nibble, smiling all the while. Before opening a food emporium in the historic district of Porto, she and her co-owners traveled the length and breadth of Portugal, sourcing the products they consider to be the best the country has to offer. Participants on a Taste Porto tour experience the tasty results! Some of my favorite new flavors from our time with Porto Food Tours included an aromatic dish of melted Caganita ewe’s cheese on country bread at Taberna do Largo, and at Restaurante Flor dos Congregados a hearty pulled-pork sandwich with a glass of bubbly red wine from vineyards near Porto. These coffee grinders, in “Hello-Kitty” pink, were mainstays of the city’s coffee culture during hard times. 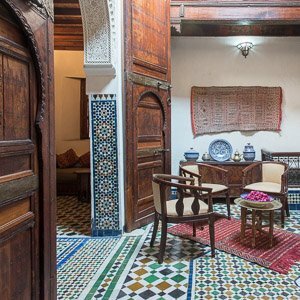 At Casa Christina, they were used to blend chicory with coffee beans, stretching scarce resources. Even now, some people in Porto take their coffee with chicory. 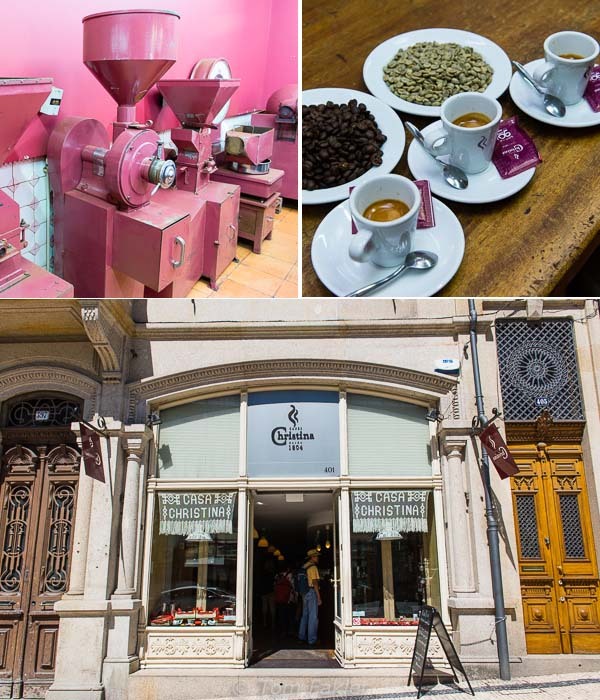 A stop here offers splendid coffees and teas, just right for a mid-tour break. Flamed sausages were a special taste treat at Taberna do Largo. At Leitaria da Quinta do Paço, you can choose either a sweet or a savory éclair…mine was one of these chocolate beauties with extra cream on the side, as a decadent end to our culinary walk. Learning a new food culture involves new words, and new food stories. 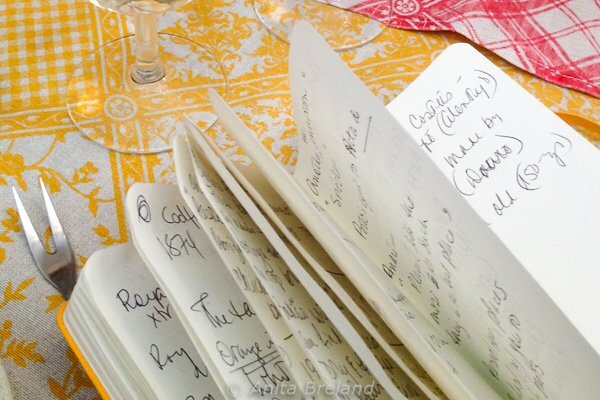 André’s tour is full of stories, and he provides opportunities for explanation and rest note-taking. 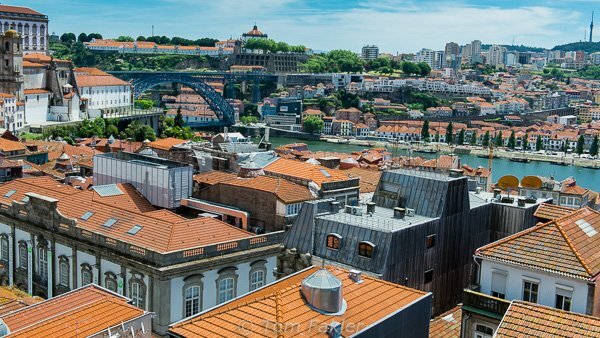 Our walk included a stop for a look over Porto’s rooftops to Vila Nova de Gaia, and background that served as a preview of our port wine tasting there. Like all good tours, this one was intensive, rather than comprehensive. 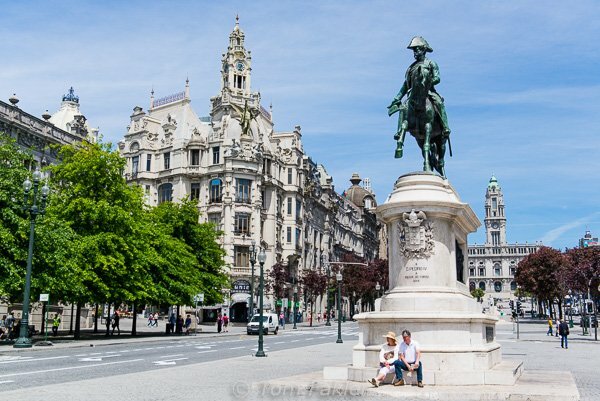 We did not taste two of Porto’s more intriguing culinary specialties– Francesinha and the culturally important tripe–but André regaled us with the lore about the locals’ love of both. I for one, was quite satisfied with the flavors, sweet and savory, that we experienced with Taste Porto, and did not feel deprived at the omission. Maybe next time?! A walk with André of Taste Porto Food Tours hustles participants us up and down that city’s hilly mid-section. 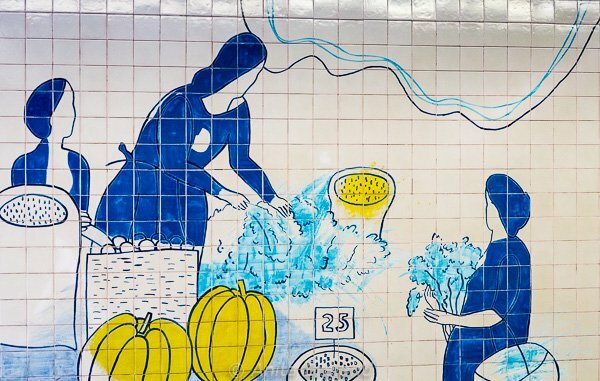 Get ready to eat (a lot) and learn a morning’s worth of the city’s food history. Our walk in Porto kicked off a week of Portuguese food experiences with fellow bloggers James Martin and Martha Bakerjian. Next articleBasel, Switzerland’s Town Hall at 500 years! 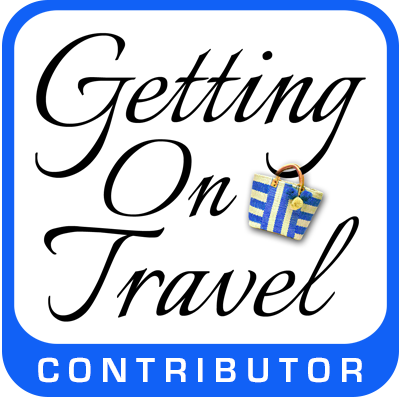 Looking forward to staying connected, as like you I am always on the lookout for “cultural traditions & a never-ending quest for art, good food and the people who make it”, especially concerning the concept of “creative travel”. Hopefully, we’ll get to meet in person one day !!! Thanks so much, Elena! 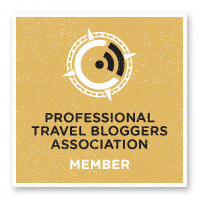 I’m delighted to discover your blog, and it certainly looks as though we follow the same travel muse. Would love to meet up one day, so please stay in touch! I agree about the walking. And in the case of Porto, the walks are up and down hilly streets. Sausages, eclairs…all good here! Bubbly red wine. I’d like some now. And the chocolate eclairs! Every time I read a post from you about Portugal I feel like it is calling me to go there! This walking tour looks fabulous and thank goodness it’s hilly (food= calories = walk, walk, walk). 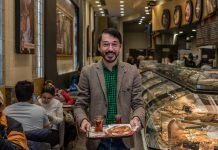 Food tours are my favorite way to discover a city and culture, and this is a very good food tour! No better way to see new places than with a local who knows their way around. Getting to sample the fare along the way makes it even better. Agreed! 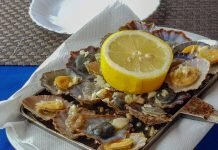 Some foods of northern Portugal can be heavy, even intimidating, and these are the ones a traveler hears of first. Sampling on a tour like this one makes it possible to try bites of deliciousness not always on our radar. Hmm. I probably wouldn’t be sorry about missing the trip. 😉 But, everything else looks like it was yummy. I would not have imagined Portuguese cuisine to have been so cheese and sausage intensive. Food tours have been notably lacking in my travel experiences. You have convinced me I need to remedy that. Good one. 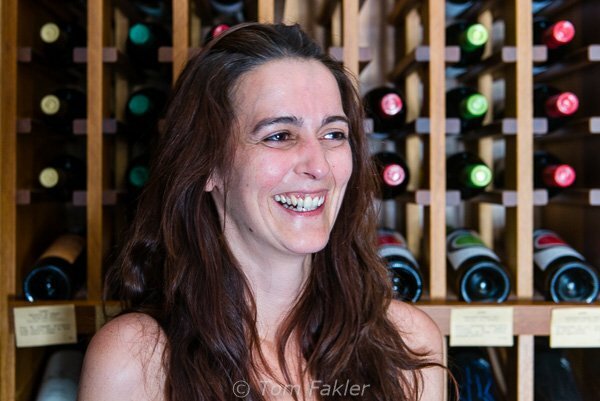 Suzanne, you definitely need to put a Portuguese food tour on your itinerary one of these days. Great ones are on offer, in both Porto and Lisbon! That looks wonderful, its been over 20 years since I’ve visited Porto, I need to go back again and taste the amazing food again! Amazing yes, and no doubt updated since you were here. Time for a return trip! We love taking food tours wherever we go and with Porto on our itinerary this year, it is great to know about Taste Porto Food Tours. I’m so looking forward to tasting some of this fabulous food! Looks like a marvelous tasty tour of Porto. I’d love to try those flaming sausages. Adding Porto to the must-visit list. They are yummy, Sue…am pretty sure you will love the flavors here. Let us know when you are headed our way! We are heading to Portugal this May, so we’ll be sure to check out these food tours! What a lovely post! 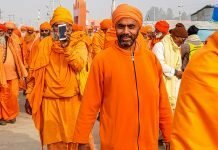 Thanks for this – I am actually going to be spending a significant amount of time in this city to update a guidebook – so this is a really useful post. Thanks for sharing. I’ll be sure to check out this company and tours.